There are good safety reasons for cameras on school buses. This technology can help to ensure that children stay free from harm while inside and outside of the bus both to and from school. Video cameras are becoming increasingly common on student transportation vehicles. They can be used to monitor the actions of the passengers and the driver. When an accident or near-accident occurs, the footage from the video cameras can be used to confirm eyewitness accounts about what occurred. Bus companies may want to consider installing cameras on school buses as a way to monitor employees on the job. Drivers who know they are being monitored constantly may be more likely to follow company policies appropriately. If an issue about adhering to them arises, the company can use the video evidence to support any disciplinary action it decides to take, including dismissal. Bullying, both at and away from school, has come to the forefront in recent years as an issue that concerns parents, teachers, administrators and students. Installing surveillance cameras in buses is a way to keep track of the passengers' behavior. The playback can be used to support allegations of bullying and properly identify victims and perpetrators so appropriate action can be taken. Cameras on school buses can also be used as a way to help keep students safe from crime by keeping track of the exact location of the vehicle as it travels along its assigned route. Any deviations can be detected quickly and reported to law enforcement officials, if need be. Honeywell Video Systems offers mobile video systems to help keep drivers and passengers safe while on the road. The company's offerings include cameras, recorders and a GPS receiver to track a vehicle's exact location. The company's digital video recorder offers customers the benefit of a lengthy recording time with little maintenance. The unit is contained in a tamper-resistant case, and the hard drive is protected against shock and vibration so that it can continue to function while in transit. It captures sharp images and the recorder starts working as soon as the vehicle's ignition is switched on. The Honeywell video recorder, when set up with one of the company's high-quality video cameras, forms a system that provides images in all light levels - including total darkness. This company's cameras are easy to install and highly durable; it can be mounted on any flat surface. A GPS system that is compatible with Honeywell's video recorder and camera is an option that can provide an increased level of security for the bus driver and passengers. The unit allows the vehicle's speed, location and direction. 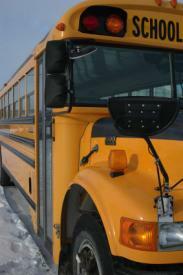 The Safety Vision company provides audio and video recording systems for school bus companies. One option is a system that includes four cameras and a video recorder. The company also offers a system with two cameras. Color cameras, including a unit that makes audio recordings, are among Safety Vision's product offerings.Customers who choose to work with Safety Vision have the convenience of having the school bus surveillance footage downloaded automatically. Specially-developed software allows the bus company officials to review the footage from any computer terminal in the company network. Parents, transportation companies and school officials all have an interest in the many safety reasons for cameras on school buses. They all share the same goal, which is to get students transported to and from school safely without incident. Video cameras are becoming increasing common in workplaces and areas where people tend to congregate, and for a number of school boards it makes sense for this technology to be used on school buses too.